Today I received a letter. Well it was a delivery really as I bought a sticker for my ereader cover from ebay for the princely sum of $1.25. Out of habit I had a quick look on the envelope to see how much the postage actually cost - as opposed to what I was charged. And the answer was shocking..click here to see why..
okk - ok, sorry, we're not on Facebook, so just read on. So the answer was actually really interesting. The postage cost 70c, so the 80c charge was completely reasonable. But check out the stamps..
Yep, Bicentennial stamps. A little bit of web research revealed that the one on the left was discontinued in 1988, and the one on the right was discontinued in 1986. So that raises some questions. This person has an ebay store so presumably he or she is posting quite a bit of stuff. So do they have a stock of these stamps? How ? Where ? Huh? 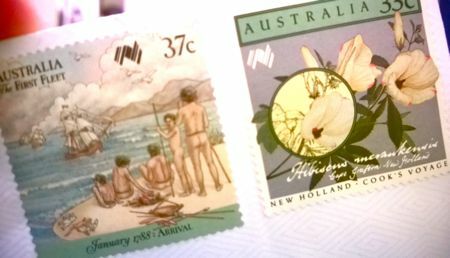 Or maybe they just print elderly looking stamps, to save on postage? I dunno. I'd like to know but I guess it's just going to have to be an unsolved mystery for me, along with what happened to the packet of marshmallows, and the location of my passport.